Whew! We made it through the birthday party! It was great! I’ve got another post coming up today with the some of the details, so y’all stay tuned on that. 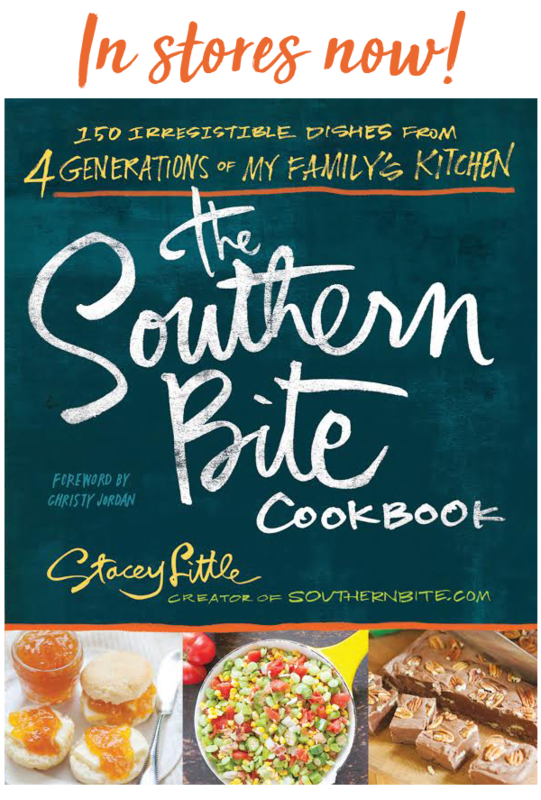 I’ve got a quick little story for y’all today and an awesome recipe that brings back so many memories for me. Okay, so to set the scene… I am NOT a morning person. In fact, I’m the total opposite. So mornings with a two-year-old, er, uh, … THREE-year-old can be challenging. Well, many mornings, my little guy will get up and if I’ve not yet risen from the dead, he’ll climb in the bed with me. Well, with my super-sonic daddy ears, I heard his feet hit the floor this morning and his door creak open. But, apparently I fell back asleep for a few minutes and awoke to him saying, “Daddy, can you help me?” Realizing that I had fallen back asleep and that he could have the dogs hog-tied by now, I flung my eyes open to find my precious little boy standing beside my bed dressed from head to toe in his new baseball uniform his Gamma gave him for his birthday. 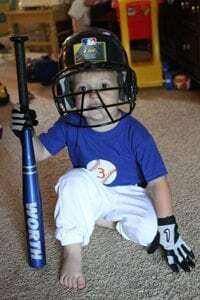 And when I say head to to toe, I mean baseball pants, belt, pajama shirt, helmet with face mask, and he was vigorously trying to put on his batting gloves. I laughed out load. Every day with that little rascal is a joy. I wish he woke me up like that every morning. 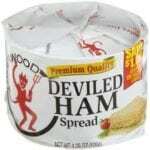 When I was a kid, I LOVED deviled ham. You know what I’m talking about? The canned meat stuff in the can with the white paper wrapper… kinda like potted meat? I remember so many lunches with deviled ham as a kid. I’m not sure why I do, but I just love the stuff. Well, as an adult, I still crave that flavor. So I decided to put together some deviled ham of my own. It’s quick, easy and can be used on a sandwich, which is how I like it, or can be served as a dip or spread on crackers. And it’s pretty close to the original stuff – and I know exactly what’s in it, if you know what I mean. It’s a great way to use leftover ham, too! I sometimes just buy the chopped ham in a pack in the meat case at the supermarket just so I can have this, though. This dish may not look purdy, but it sure is yummy! This makes quite a bit, but the recipe halves easily. 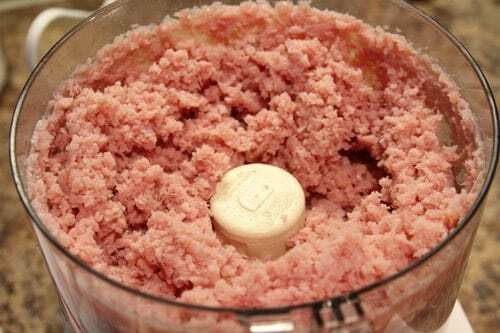 In a food processor, pulse diced ham until finely chopped. This can be done by hand, but a food processor sure is much faster. 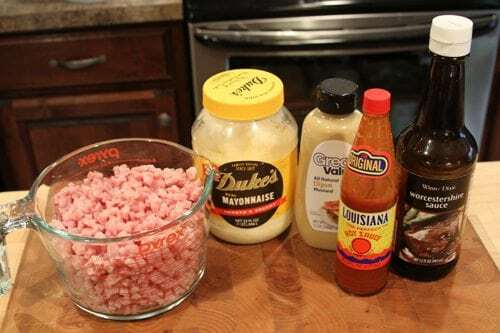 In a large bowl, combine ham, mayo, mustard, hot sauce, Worcestershire, and vinegar and stir to combine well. Refrigerate for at least two hours for best texture and flavor. I so remember deviled ham! I still love it, but the last can I bought was not very good, so I haven’t bought more since then. I can’t wait to try this recipe. You’re right, it isn’t the purdiest dish to look at but it’s purdy tasty! Oooooo it’s so good! Let me know how it turns out for you! Wow, the memories! I too over the years have found that the canned stuff is not as good as it use to be. I have some left over ham that I was trying to figure out what to do with, now I know! Thanks for such wonderful recipes! I’m so glad I could solve that problem for you! Enjoy! Oh man, I loved deviled ham but have hesitated to buy the canned stuff for my kids. I am so making this! Thanks! I’m glad to see that someone else is fond of deviled ham. I took the same kind of sandwich everyday of grade school..deviled ham with miracle whip on white bread, no crusts, please! I never would trade sammies with anybody! Mine was too good to trade! I live in Hope, Arkansas, but I am originally from Lawton, Oklahoma. I’ve never used Duke’s Mayonnaise, but I love me some Hellmann’s. was younger, but do not find it very good now. I will definitely try this. Interesting sounding recipe! I will have to try it. I remember seeing the deviled ham but I don’t remember eating it. However, my family’s favorite part of a Honey-Baked Ham is the leftovers. I pulse them in the food processor and add mayo and Wickles relish. Serve on fancy crackers and YUM! Sounds delish! I do love some Wickles! Oh my, that sounds pretty good too. Love it.. I also add some horseradish and a handful of grated cheese to mine..& lots of black pepper. We ate deviled ham all the time. Thanks for the memories, Stacey. Stacey, do you like Alabama White BBQ Sauce? I know that’s a real North Alabama thing. A friend sent me their family recipe and it’s really good. People from LA don’t know anything about Alabama White BBQ sauce. It’s funny how dishes can stay so regional. I LOVE some white bbq sauce. Yeah, it’s really North AL. I love it though especially on some pulled pork. Mmm! My tummy’s growling just thinking about it. I used it on grilled chicken and it was so good. I want to use it on salmon next. I don’t believe I’ve ever had deviled ham! This looks yummy though so I will have to try your recipe! The white packaging is familiar though…!! 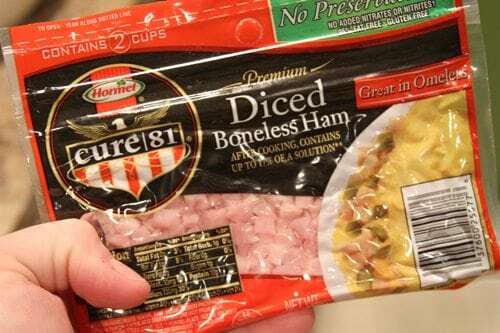 I guess it’s something like ham salad, but I’d much prefer this. Hope you like it! 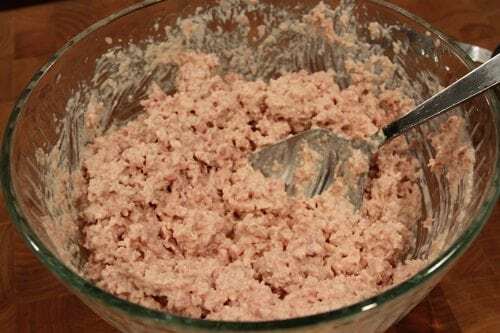 I have made ham salad for years. If you can put it through a grinder instead of the food processor I think it it has a better texture. I just add mayo and sweet relish to mine. This looks so good! I have to admit to liking the canned stuff when I was little. One year after some holiday when we had lots of ham left, my Mama made some ham salad kinda like this, best sandwiches ever! I think she left out some of these ingredients and added a little pickle relish or chopped pickles…but it all sounds good to me! Oh! This brings back memories of my mama. She LOVED that little can of deviled ham. She used to add a little mayo (Only Best Foods/Hellman’s of course), a little sweet pickle relish and a little salt and pepper, spread on fresh white bread with plain Lays potato chips and a tall glass of iced tea. She was in HEAVEN! This was her “treat” a couple of times a year. I hope she gets to enjoy this a few more times than twice a year up where she is in heaven. Thanks for the great memory. Angela, how sweet! Thanks so much for sharing! I bet she’s getting all the deviled ham she wants up there! So glad this brought back memories for you. These kind of comments just make my day! Angela, I have similar memories of my dad. Three things I remember eating with him that I haven’t had since he passed away – deviled ham sandwiches on Wonder bread, slices of Spam dredged in flour and fried, and Vienna sausages. The sausages were required (along with a sleeve of crackers and a bottle of Tabasco) when we went fishing but the deviled ham sandwiches were a special treat. 🙂 I’ll make a batch of this next week in honor of my dad and your mama. Thank you, Stacey. Sweet, sweet memories! Thanks so much for sharing!!! I was going to ask if this was anything like ham salad when I saw your reply above. I’m a born Yankee (I’ve lived my entire life in the same city in Illinois), but I swear I’m geographically misplaced. I’m sure it has something to do with my Arkansas-born grandfather. You don’t see much deviled ham here, but I have to tell you we used to have “ham salad” growing up. Now, the funny part is that we all knew it contained bologna, not ham, but we called it ham salad anyway! 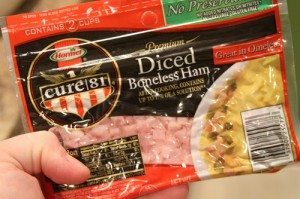 A few years ago, I asked my dad (tongue in cheek), “Did you know you can make ham salad using actual ham?” We had a good laugh over it. And earlier this year, I had bologna salad again when my husband’s aunt brought it to a family gathering. Tasted just like I remembered! I just made this using my leftover Easter ham. It’s going to be tough to let this sit for a couple of hours in the fridge! So yummy! Stacey, you have brought back a lot of memories with this one. I have a thing for canned meat. I always joke about it, but it’s true. Potted meat, deviled ham, sardines, smoked oysters, and let us not forget SPAM! LOL I just love meat from a can. What can I say? Can’t wait to try this! PS: And vienna sausages too! Just whipped up a batch of this! I had pinned it MONTHS ago but today was the day! But I only eat Blue Plate mayo its an Alabama thing!! I think the hot sauce set the bar!!! Don’t know how long I can let it sit so the favors can get acquainted. Love all your recipes!! Thanks for sharing, Deborah! I hope you enjoy it! In [reparing for “Frankenstorm”, I requested that my husband pick up a can at the store. However, I guess everyone else had the same idea…NO deviled ham. I am craving it now, so I am going to use the packaged ham he got instead and try this right now! Thanks for the recipe! I hope you enjoy it, Edie! Y’all take care up that way! Oh, you’re making me hungry for a little toast w/deviled ham spread. Thanks, it’s next on my “to-do” list! I, too have had yummy ham sandwiches, but..only made with bologna. Was never really sure if you used ham. Just know it was good. But.. I’m using ham, to see the difference between the two. Either one I’m sure will be very tasty. Thanks for the recipe. Found your recipe for deviled ham yesterday and just made a batch tonight. Gotta tell ya, Stacey- it’s far superior to the canned stuff! And to think I used to like it. Yours is less salty, fresher tasting and I saved a bundle. Thanks! I am hoping one of your new projects will be a replacement for the deviled chicken. 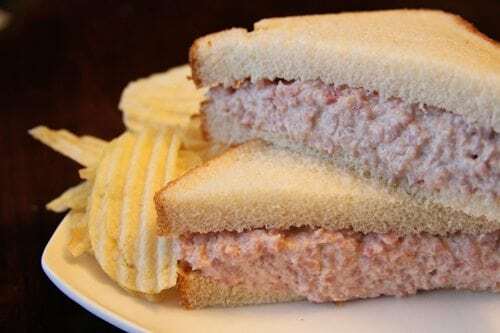 Stacey, as I was growin’ up, my mama loved to make deviled ham sandwiches (served alongside potato chips) for lunch when it was just too hot to cook. This took me right back to my childhood. Thanks so much for the memory and the recipe. I know a 12 year old boy and his daddy who need some of this! Yum and Yum! I had some leftover ham so I thought I would try this. It was sooooo good (I couldn’t stop eating it). Thank you for the recipe!!!! It certainly is a favorite at our house! I’ve spent some times in the US, where I discovered the deviled ham. Back to France, we just cant’ find it !! I’m so glad I found your recipe that will allow me soon to enjoy again some arepas with furthermore an healthy filling ! I have made this twice recently and my husband and I both thought it was mighty tasty! I remember the little cans of the deviled ham too but must say your recipe is far superior! Thanks for sharing your recipe. It is going into my rotation or recipes! I am so going to eat the heck out of this!!! Two of my favorite things in the world are ham and Duke’s Mayonnaise. 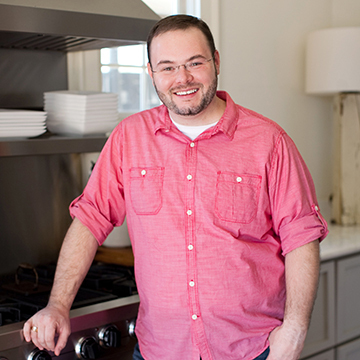 I really like your website and can’t wait to try some recipes. Thanks, Carrie! I’m not sure how freezing it would affect the taste and texture. I’m not sure I’d chance it. Hope you enjoy it! I have leftover ham and was looking for a recipe for deviled ham. Think I found the one. I haven’t heard or read any comments about hard boiled eggs in their recipes, but even as a kid when mom would use the canned spread, she would chop up eggs to add in. I will continue the tradition. If you haven’t tried it I would urge you to do so. Sounds like a great addition! I hope you’ll enjoy it! Here is the recipe I learned from Mom a loooong time ago… Put ham in food processor with a little chopped onion. Pulse until it’s to your likin’! Then spoon into bowl and add mayo and dill relish. That’s it! Easy and delicious, I’m sure!! I can’t believe that you posted this! How cool are you, and brave for admitting that you once ate that horrid canned stuff with childish oblivious pleasure. Here’s my problem, my husband loves that canned Deviled Ham. Running the risk of being indelicate on your blog; I will just say that even opening that can triggers a gag reflex in me. So, I told him that since I was recently blessed with a food processor that I could make him some. Piece of cake right? How hard could it be given that it is just pulverizing some cold ingredients, right? Wrong, the first batch that I made, while not as nice as yours because the genius of Worcestershire sauce did not occur to me, was to my mind pretty good. I know this because I ate it all myself. I made it with perfectly nice Ham, Hellman’s, French Dijon, a splash of Apple Cider Vinegar & Tabasco. My husband you see was horrified and asked how after years of cohabitation I could somehow suspend his cast iron no-mayo rule (enforced historically for him only). I defended myself, ‘no!’ say I, ‘the canned stuff has mayo in it’. The truth is though, that it doesn’t. ham (cured with water, salt, brown sugar, sodium nitrite), seasoning (mustard flour, spices, turmeric). Being if anything a thorough person I pressed on. I have Colman’s, a gigantic can. That however proved too mustardy. I got Mustard Flour from MySpiceSage (the best spice site ever); http://www.myspicesage.com/mustard-flour-p-178.html Still, no joy. What is the answer I wonder to actually reproducing the taste of that canned stuff? Will it produce the same gag reflex too? I wonder. Sounds great to me, I’ll have to try it. I got a cheap ham after easter and I know we’ll be eating it for a week. Since I’m a stay at home dad, I’ve got to come up with different ways to get my kids to eat it. we always had “poor man’s ” ham salad. ours was made with bologna ad kraft sandwich spread. i still make it and my daughter likes it too. I just tried this recipe today & love it. Though it isn’t exactly like the canned DH, I think the big difference is that it lacks the grease. Remember that grease floating on the top when you opened the can? It’s funny because I always loved Deviled ham & Vienna sausages, too, and so many people think I am nuts because I do. And I never buy red meat, can’t bear to look at it in the store & yet Deviled ham & Viennas are dear to my heart. I also despise Miracle whip & love Dukes. Stacey, according to me you have excellent taste! Thanks for the recipe. This is just the one I was looking for. All the others add a bunch of stuff. I cooked a ham tonight and will make this tomorrow. I sure hope you’ll love it like we do! Is it okay to can this if the mayonnaise is not added until after it’s opened? If it can it will be a great pantry staple to have on hand. Seems to me to be a great idea! Just follow the time table for pressure canning ham in your Ball canning book. I bet it would be awesome in wide mouth half pint jars. Thanks for giving me a fantastic idea! Yeah, keep it mayo-free beforehand, until you open up a jar! 😋 Now I need to add this to my canning repertoire! Think I’ll try it next week after payday and let y’all know how it came out! Have you tried this recipe with spam? I curious since I really do enjoy Spam and love deviled ham. I have a feeling that I’m about to try your recipe and go for it ! I haven’t, but think it sounds INCREDIBLE! I know this is an old post, but it has exactly what I was looking for. Homemade “Deviled Ham”. I, too, loved it when I was growing up, but I wouldn’t eat it now. But I found a recipe in an old 1960s pamphlet for Deviled Ham Canapés. I think the mystery of why none of these mixtures tastes exactly like those paper-wrapped cans of happy childhood memory lies in the spices! Deviled ham wasn’t just salty and “hot.” It was subtly spicy with notes of warm sweet spices in addition to its more obvious hot pepper and mustard. Turmeric isn’t one of my favorite seasonings, but perhaps a hint of that is needed, too? can this be made without mayo? my hubby has been wanting deviled ham but he is allergic to eggs. I know there is eggless mayonnaise out there but he is still apprehensive about that. do you think sour cream would work? There’s no question it would work, I just worry about the flavor and texture. Every now and then as a treat, my mom would buy me a little can (you know the half size one) of Deviled Ham. I loved it so much. I tasted it recently and it just doesn’t taste the same…did they change the recipe over the last 40 years or is it just hopeful childhood nostalgia? Anyway, I came here looking for a great deviled ham recipe to use up the remains of the Christmas ham, and I have to say your recipe is the best I have had. I caught my 14 year-old son eating it out of the bowl, and he begged me to make more. In a way, I am glad he never had the Underwood canned stuff. This was my favorite growing up too. Thanks for elevating it so I can eat it as an adult!!! Can wait to try it! LOL! Hope you enjoy it! Way late to the party, but SO glad I found this. When I was first married, back in the dark ages, I used to make a deviled ham spread with the canned stuff, finely chopped hardboiled eggs, chopped green olives and chopped green onions. Haven’t made it in decades. A few years ago I thought about making it again, then I looked at the fat content on the can and decided against it. Now with this recipe I can make it again and it will be much healthier. I’ll use my homemade mayo in it. Now I just need to go pull those ham steaks out of the freezer. Thank you! I sure hope you’ll enjoy it! Don’t laugh at me. I made your recipe vegetarian-style with vegetarian ham loaf run through a meat grinder, vegan mayo, and vegan Worcestershire. I used to love the real stuff as a kid but these days I have sworn off meat products for health reasons. The result was not far off from my memory. Texture was right. My family asked for seconds. Thanks for posting this. Hey, I’m just glad you enjoyed it!! !